This vegetable, known simply as “kong xin tsai” (空心菜) in Mandarin Chinese, is called so many other names in America that I get really confused. I’ve seen it called water spinach, water convulvulus, Chinese watercress, and ongchoy . . just to name a few. It’s called hollow heart vegetable in Chinese because the stems are characteristically hollow. The hollow stems have a unique crunch that makes them fun to eat. Hollow heart vegetable is prolific in Asia, and does not even need soil to grow, profusely thriving in marshy wetlands, rivers, and streams. In parts of the US, it has become so prolific that the USDA has official designated it a “noxious weed.” It grows THAT easily. This stuff is so easy to grow, my friend Emily from Emily Ku Photography bought some from the supermarket, stuck some in a cup of water, and grew her own! Remember how I said it just grows in rivers in Asia? 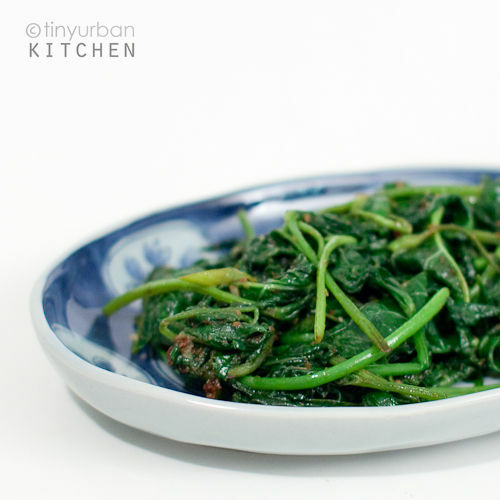 Kong xin tsai is delicious and has nutritional benefits similar to spinach. It’s my husband’s favorite Chinese leafy green, and we order it at restaurants all the time. The vegetable is prepared in countless different ways in Asia. You can cook it with shrimp paste (Malaysian), fermented tofu (Cantonese), or simply saute it with some garlic, which is classic. Here is another one of my favorite ways. Note: my veggies came from the garden so they were pretty clean. If you buy these in the market, they can be pretty dirty. You might have to wash multiple times. Soak, drain, soak, drain, etc. Treat it like you do fresh spinach. Step 2: Add ~ 1T oil to wok and heat on high until the oil is almost smoking. Add garlic and saute until fragrant (about 30 second or so – don’t let it burn!). Add the stems first and saute until softened, maybe 2-3 minutes or so. Step 3: Add leaves in and then quickly stir around until leaves are wilted (this won’t take too long – maybe like 1 minute). Remove from heat. Step 4: Stir 1 T of Chinese BBQ Sauce (or more, to taste) into the cooked veggies. Add salt to taste. Enjoy! I love cong xin cai! My mom used to make this for me as a kid all the time. Thanks for highlighting it. I hope others will give it a try. woah seriously!! grows in water? i’ma have to try it sometime!! I just recently found your blog when I was searching for broccoli stalk recipes. I haven’t tried your broccoli stem salad yet, but I did follow your recipe for lo bah png. It came out wonderfully!! These veggies are also my husband’s favorite, I’m glad to hear they’re so easy to grow. This looks like a tasty way to prepare them too! Thanks for posting! Great photos! In Vietnam, we call this rau muong..but we love the malaysian/indonesion way of cooking this called kangkung belacan. Hehe, you’re not going to feature the fermented tofu cooking method? Or the stinky shrimp sauce? Livia – actually, I love fermented tofu (dofuru), but I’ve never actually made it before. The dried shrimp paste is not stinky at all! 🙂 I’ve had it at Penang and thought it was scrumptious. That’s great you turned your slow cooker into a sous vide machine. My Sous Vide Supreme doesnt circulate the water either as far as I know and it works OK.
my absolute favorite vegetable hands down. so good. just sauteed with like garlic and soy sauce is delicious….or however my mom makes it. so simple. hahahah the way I cook it (with shrimp paste), I def make sure it gets stinky! in a good way, of course! and I’m going to try growing it in a bucket of water. crossing fingers! Cool article! I’m going to try to grow it now! This is my fav veg too. I like it tender soft and crunchy. My mom who’s from S’pore also fried it with red chilies. So, between the shrimp paste and chilies, pretty incredible. I always order this when it’s on the menu. Didn’t realize it was so easy to grow! In the Philippines, we call it Kangkung… and just as you mentioned…it grows everywhere as long as there’s water…and it grows fast…really FAST. Usually, it’s sauteed with garlic here, and paired up with fermented shrimp paste. Yes, I tried making that too! Did you see my kangkung belacan post? Visiting Taiwan and bought some 空心菜 at the store only to get it home and not know what to do with it! Thanks for the post. It tasted great! My sister-n-law brought me some hollow heart seeds. Can I grow them in a container? Sun or shade? Lots of water!